Today’s blog was no problem to write. I turned on some music, read over the poems, and let my thoughts wander where they wished. As Florence + the Machine’s song “What the Water Gave Me” played, an image replayed in my head of a beautiful waterfall I had seen only a day earlier…. October is my favourite month of the year. The changing colours and fiery spices swirl along the autumnal wind as it tiptoes through open windows and runs its fingers through your hair. Cinnamon, clove, and nutmeg permeate food and drink. A delicate chill frosts the mornings and cools the nights. October means fall, Halloween, and the drop of temperatures. I adore October. As I read through Robert Frost’s “October” again today, I thought of the adventure I had yesterday as I enjoyed the crisp air of my preferred month. My mother and I embarked on a motorcycle ride through the countryside of Cherokee and DeKalb counties. Near Fort Payne, we discovered a beautiful canyon with a narrow river coursing through its floor. My mother informed me that it was her third time here, at Little River Canyon, and that I had to see the magnificence of this natural wonder. 600 foot cliffs cut into the sky as trees cascaded down the walls of the canyon. Waterfalls, small rapids, and the river played a quiet tune that rippled through the air as the waters flowed away from us. My mother parked the motorcycle at many lookouts, the first being Grace’s High Falls. We took pictures and laughed that “my” waterfall was the highest in Alabama. As we rode deeper into the national preserve, I tilted my head back to catch the bright blue sky and flaming trees that towered above my view. A gentle breeze whirled leaves to the ground, or out into the deep chasm below. Soon we came to the falls. We hiked down to the river, and walked across the dried river bed to get close to the water. We sat apart as we both took in the natural beauty around us. I crept close to the waterfall itself, hoping to take an up-close picture of the raging current. The smooth stone beneath me was warm from the sun. A light mist splashed me as the water tumbled through open air and impacted forty five feet below into the tranquil pool. Orange and yellow trees stuck out from the surrounding greenery as the first changes of fall made their appearance in front of me. At peace, my shoulders relaxed as all the tension fled from me. It was here, in nature, that I could rest easy. I sat there in the sun listening to the water for what seemed like an eternity. My mother interrupted my thoughts: “C’mon, Grace, on to the next place!” I opened my eyes, the sudden brightness of the trees exploding in my vision. 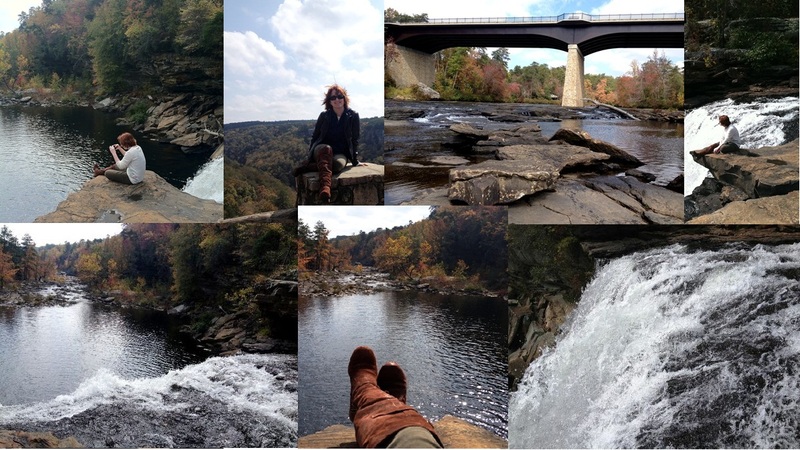 We drove on, stopping next at DeSoto Falls. DeSoto Falls was not as natural as I had hoped. It was more of a manmade creation, than that of the divine. Metal bars and warning placards kept visitors in check; concrete and manufactured steps disturbed nature’s path. We moved away from the other people, going out further to where the guard rail stopped. My mother encouraged me to creep out, onto a solid concrete buttress. I was a little afraid, but I managed to snap a few pictures from my exposed perch. As we hopped on the motorcycle to head home, my mother and I discussed the loveliness of the two places we had visited. In awe of such divine creation, I was glad that we had enjoyed our day in the natural wonder that surrounded us. It was a day that could inspire poetry, and a day that poetry will remind me of. Whenever I will read “October”, the bright colours of the leaves, the unhurried trickling of the river, the roaring of the waterfalls, and the brisk yet mild air will reemerge from my memories.